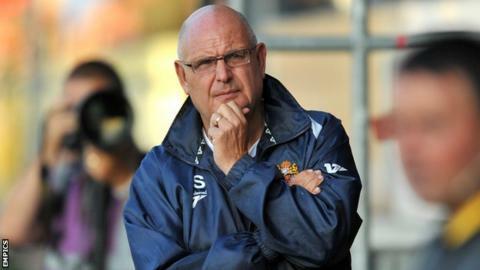 John Still is expected to leave League Two side Dagenham & Redbridge to become boss at non-league Luton Town. BBC East Sport has learned that Still could be in charge in time for Tuesday's trip to Braintree. Still led the Daggers to promotion to the Football League in 2007 - a feat Luton have been trying to achieve for four seasons - and won the League Two play-offs three years ago. The 62-year-old also took Maidstone United out of the non-league in 1989.
with the club eighth in the Blue Square Bet Premier. The Hatters cited personal reasons for the departure of Buckle, who masterminded an FA Cup run this season which included wins over Wolves and Norwich City, but struggled to launch a concerted push for the league title. Still, who embarked on his second spell as Dagenham boss in 2004, has been roundly admired for his ability to not only take the east Londoners into the Football League with limited resources, but for also bringing a season of League One football to Victoria Road and stabilising the club as a League Two side. He will become the fifth manager to attempt to re-establish Luton's Football League status, following the departures of Mick Harford, Richard Money, Gary Brabin and Buckle over the past four seasons. The two-time Barnet and former Peterborough boss will end his run as the Football League's longest serving manager should he quit the Daggers and will leave them 16th in League Two, eight points clear of relegation. Luton, meanwhile, are 11 points off the Blue Square Bet Premier play-offs, with as many as three games in hand on teams above them.